We left off our trip down Kensal Road before Christmas and we were round about the Lads of the Village pub on the corner of Middle Row. You could just make out the petrol station a little further east. The White Knight Garage. I seem to have been wrong about the cars in the previous post so instead of making a guess, I’ll ask my motoring readers to identify the parked car. Just to show you how far (or not) we’ve got, take a look at this OS map. Pulling back slightly, here is the northern side of the road where light industrial buildings are right next to terraced housing and shops. Is tat man ready to drive inside? 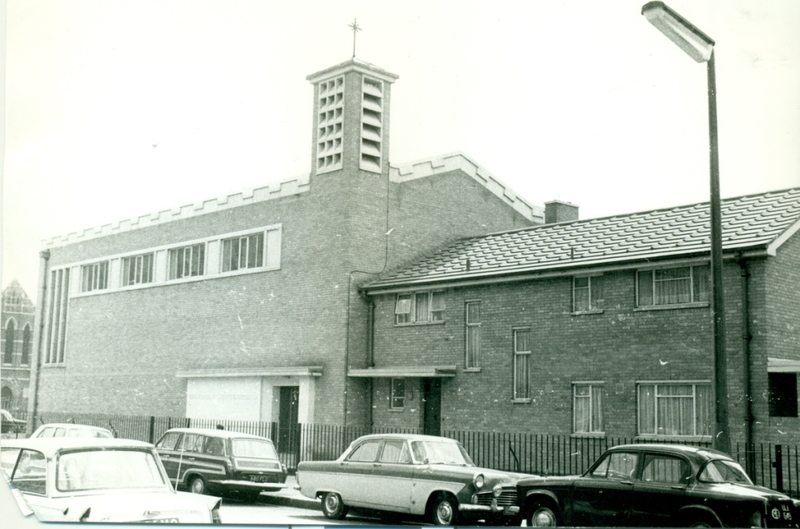 Beyond the garage some motor works, followed by the Church of St Thomas, a relatively modern building in 1968. You can see a kind of bas-relief on the side of the church. The open space behind the wary pedestrian was designated as a playground at this time. (Is he hanging back for John or what?) The map describes the large building on the right as a pharmaceutical warehouse. 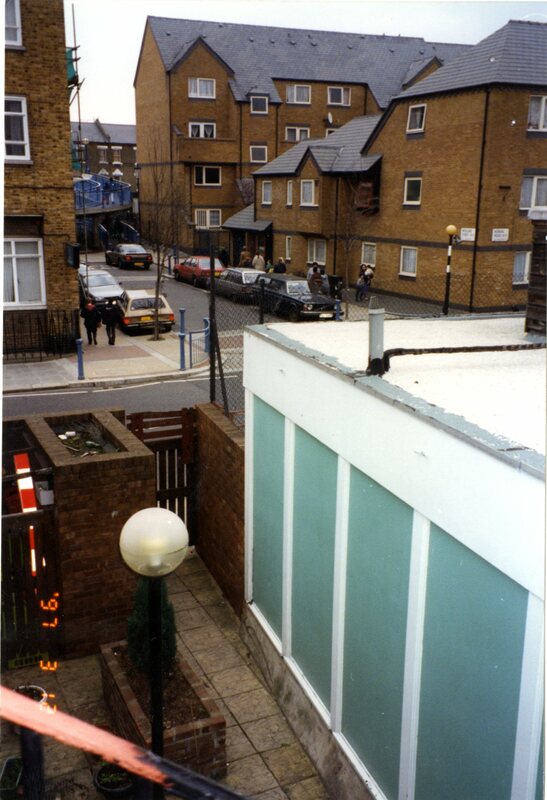 Here is one of those collages from the Planning collection showing this section of the street in the 1990s. It’s all boarded up awaiting development or demolition. Back in 1969 both sections looked a little more active. The terraced housing on the north side looked like this. We’ve just about reached Wedlake Street. Here’s the open space to the south as it looked in 1969. The church is Our Lady of the Holy Souls on Bosworth Road. Next to it Bosworth House and Appleford House. The tower is Adair Tower ,one of the first tower blocks in the area. 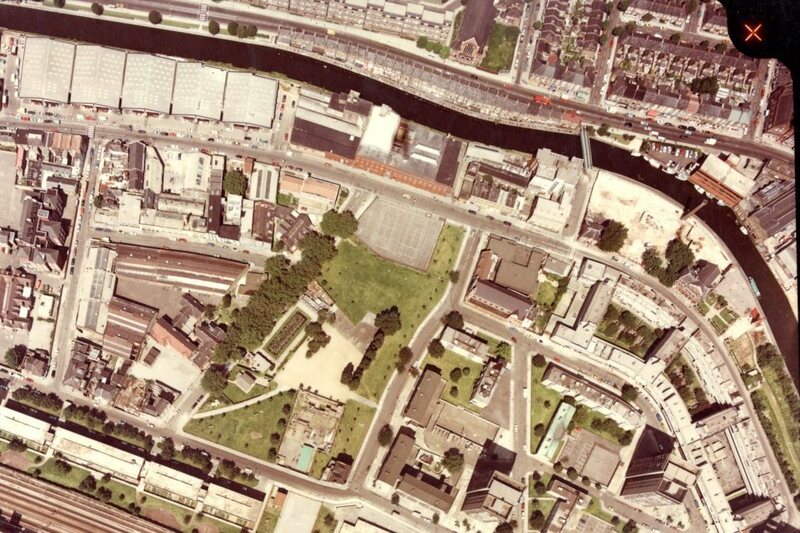 This is the companion picture to the aerial shot from the 1980s in the previous post. 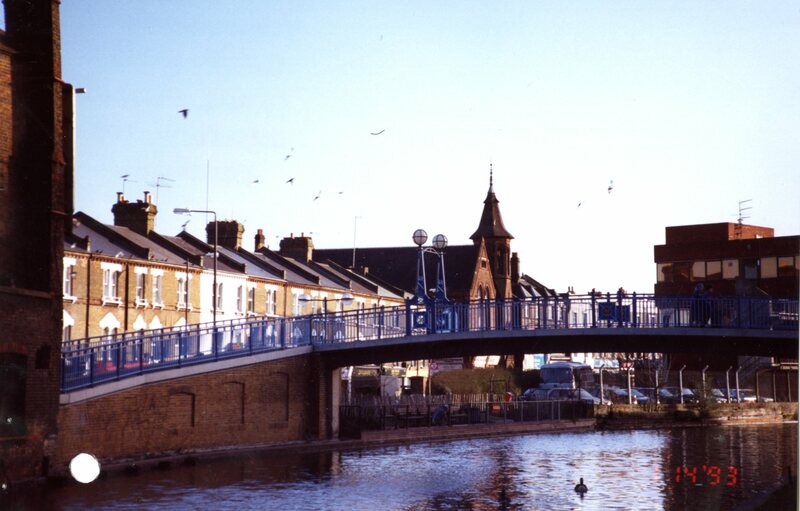 You can see the bridge over the canal and the space where the baths were. That site is almost completely cleared apart form the Vestry offices building and (if you look closely) the chimney, sitting on its own by the side of the canal. I can’t quite make out if the bridge has changed from this angle but later pictures show that it was replaced with something a little more pedestrian friendly. 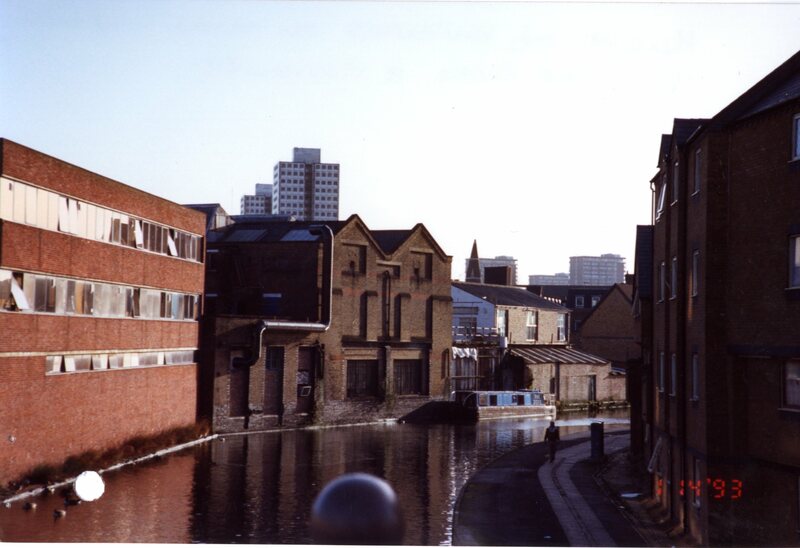 Here is a view showing Wedlake Street in the late 1990s. The old Vestry building has also gone, replaced by a residential development. You can just see the bridge. And there it is. Rather more pleasant to cross in this form I should think. On the Paddington side of the border, the terraced houses survive. One final look down the canal to the east. 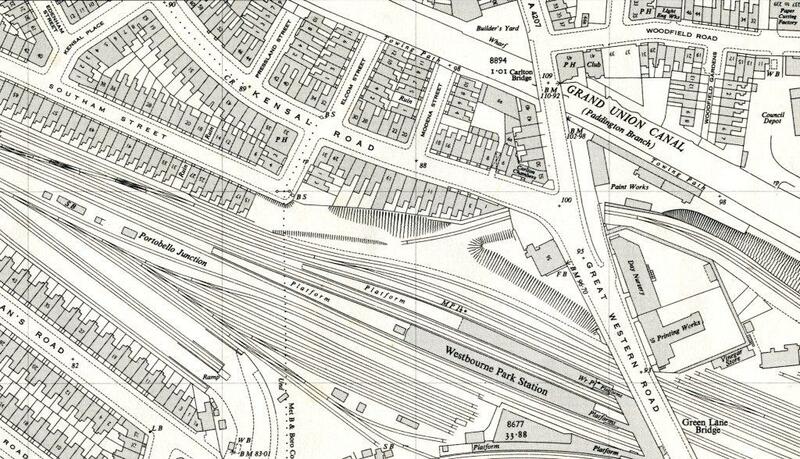 As you may know, Kensal Road once went all the way to the Great Western Road as on this map, whose top corner shows the intersection, along with a number of streets which no longer exist – Southam Street, Modena Street, Elcom Street and Pressland Street. 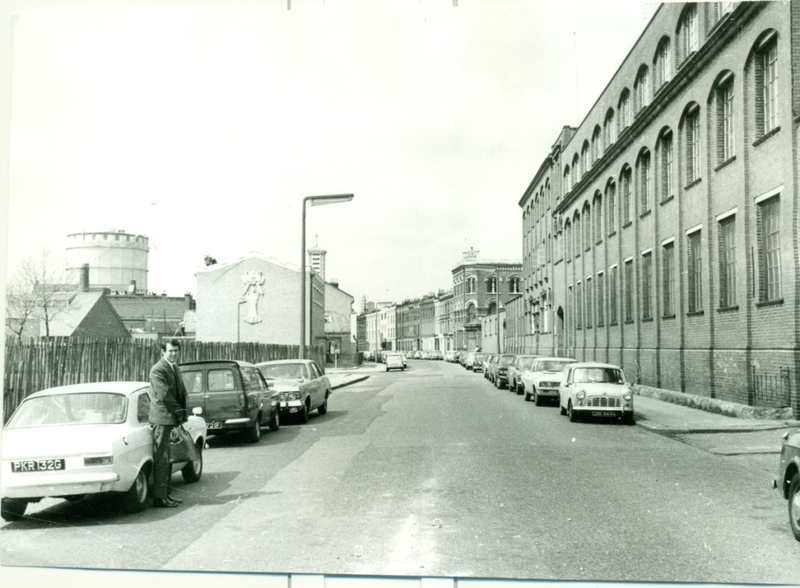 Those streets were demolished in the late 1960s / early 1970s when what was first called the Edenham Estate was built. The centrepiece of that estate was Trellick Tower, now a major landmark, geographical and cultural. When John took most of these pictures, the foundations of the tower were already under construction and Kensal Road truncated as it is today. 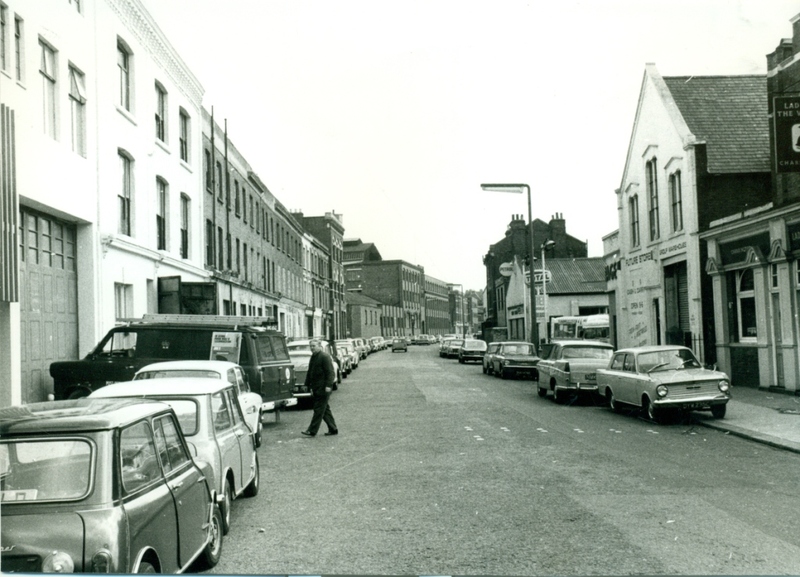 But I think one picture in our collection taken in 1967 shows the missing section of street. I can’t make out any numbers or street names (the only one visible is too blurred) but I think this is a view looking west and downwards (you can see a slight slope). On the right you can make out what might be Modena Street and on the left, as the road curves right, the entrance to Southam Street. Today, the Westway passes over near this spot and Elkstone Road does the job of taking you past Meanwhile Gardens towards Trellick Tower and Golborne Road, taking a slightly different route, closer to the old route of Southam Street. 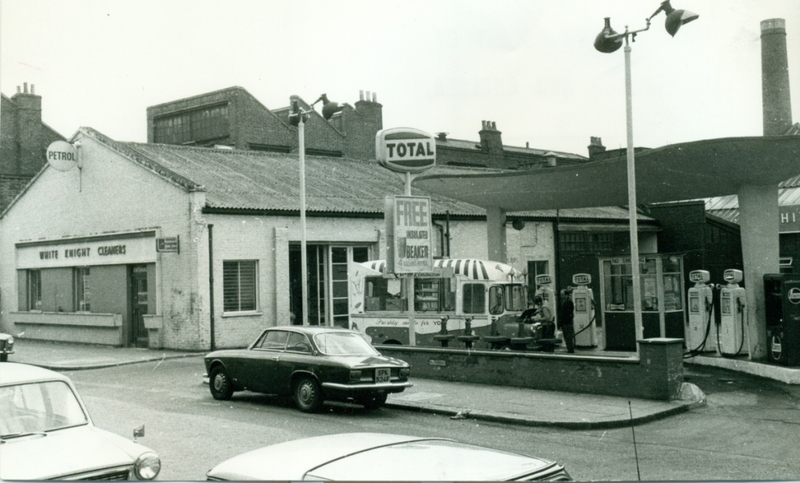 So this picture takes us to what used to be the western end of Kensal Road which only now exists as a memory or a photograph. Another lengthy blog journey comes to a close. It’s been tricky balancing pictures from different times to tell a story so if I’ve made any errors, please correct me. Time travellers don’t always get everything correct and sometimes you get back to the present and find that things have changed. Thanks of course to John Rogers who took the 1969 photos. And thanks to everyone who told me to keep blogging. I wasn’t fishing for compliments, honestly but it’s nice to be appreciated. And I will keep going. This entry was posted on Thursday, January 11th, 2018 at 9:43 am	and tagged with John Rogers, Kensal Road and posted in 20th Century, North Kensington. You can follow any responses to this entry through the RSS 2.0 feed. I think the car parked in front of the garage is a Lancia. I believe that the car in the first pic is an Alfa – but don’t know which model. I am sure someone will enlighten me……. Great research as always, Dave, and some great old photos of my old street I haven’t seen before but I disagree with Dave H about the car 🙂 It’s an Alfa Romeo 1750GT. I couldn’t remember where the petrol station was exactly but the longer distance photo of it with the Lads of the Village just at the right hand edge of the photo helps me position it. 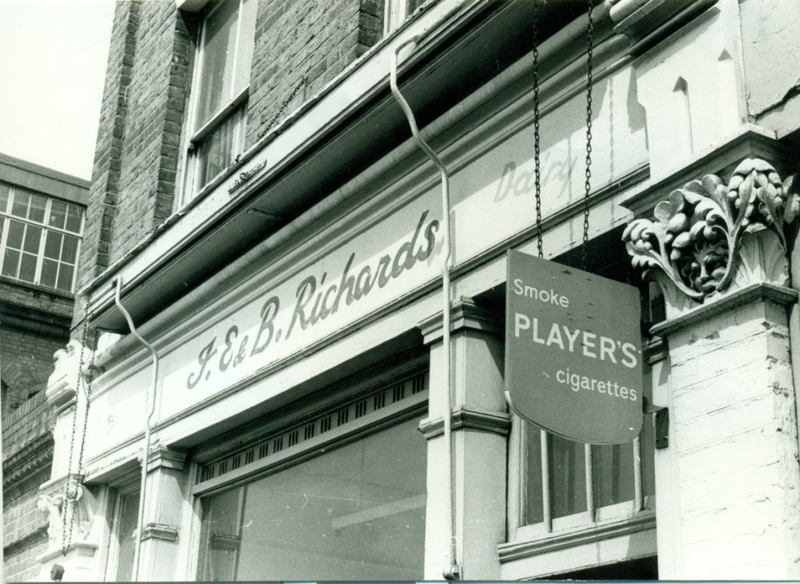 You mentioned the pharmaceutical works at 222 Kensal Road. 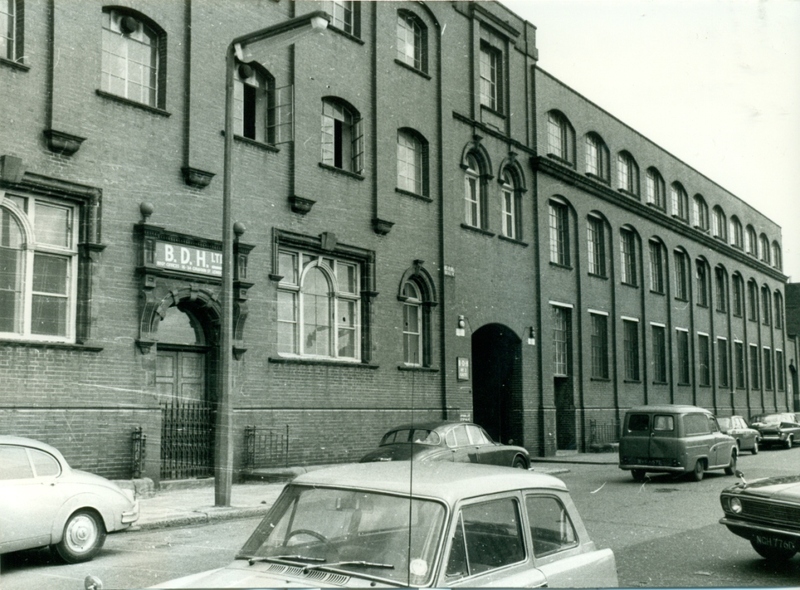 That was BDH (British Drug Houses) at the time and before that, it was occupied by Oliver Toms, who manufacture ovens for the catering industry. A closer inspection of that building, one of the last remaining original buildings in the road, reveals ‘Globe Wernicke’ in the brickwork, who were manufacturers of office furniture especially bookcases, so the building has gone through several incarnations. The open space opposite that building has been an open space since it was cleared of bombed damaged houses. It was tarmacked over and know locally as the black pitch and them, some time, later turfed and incorporated into the enlarged park. One more point I meant to make, about your comment regarding the 1967 photo. If you stand in the refuge halfway across the zebra crossing at the junction of Elkstone and Great Western Roads and look down the hill, you will get exactly the same perspective as in that photo and my guess is that’s where that photo was taken from. Alfa Romeo Giulia, probably a Sprint GTA Stradale which would make it quite a valuable car today! ‘Wishfull thinking’ says a mate who definitely knows more about cars than me, ‘just a run of the mill Alfa Romeo Giulia’….. The car in top picture is an Alfa Romeo Giulietta coupe, handsome and stylish to this day. At least I got the country of origin right! Hi, the car is a 1967 Alfa Romeo Giulia Sprint GT Veloce and it was last sold in 2007. The car is advertised for sale in the Sept 2007 issue of Classic and Sports Cars. Just to finish the detail, The Alfa Romeo Giulia Sprint GT Veloce has a capacity of 1600cc and was replaced by the new Alfa Romeo 1750 range in 1967. These cars had the improved 1779 cc engine, producing 120 bhp. The 1750 GT Veloce (also known as 1750 GTV) replaced the Giulia Sprint GT Veloce, and introduced many updates and modifications. 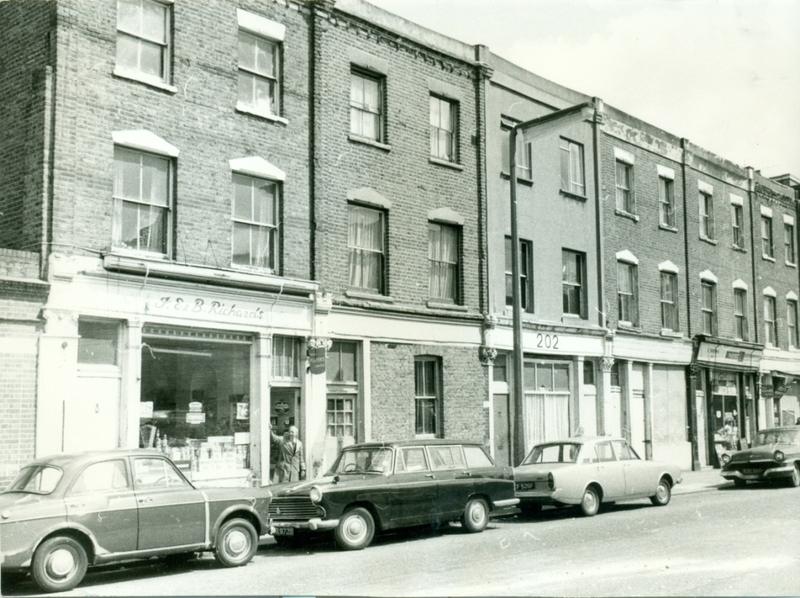 we used to live at 200 Kensal road, I remember Mr Richards shop and I think Mr Browns sweetshop, I went to the nursery at the end of Kensal road where i remember smashing old tv sets up with a hammer, some sort of therapy/teaching? and then to Wornington school with my brother Marc. Alastair – That’s a fascinating story because I was a big fan of the Telegoons and had no idea the programmes were part produced about 400 yards from where I lived at the time. 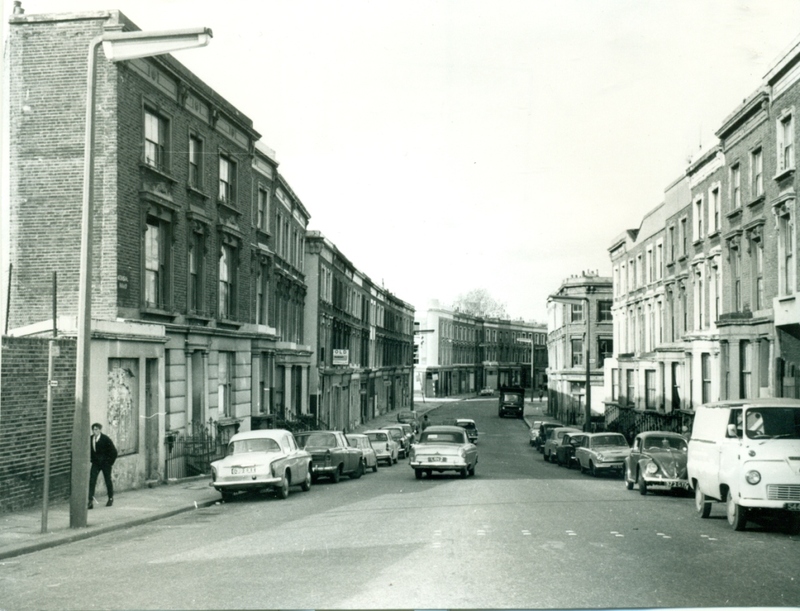 I don’t mean to hijack Dave’s excellent blog but, if you are on Facebook, you might like to join the Old Notting Hill and North Kensington History Group, which has nearly 5,000 members, including a large number of former residents and people who worked in the area around that time. Some of our members may be able to help you with your research. If it’s of interest, please apply to join and I will let you in and then you are welcome to post an appeal for information. Roger: Awaiting your approval at the History Group, 4 December 2018.